How does JUVÉDERM® Work? Young, healthy-looking skin contains an abundance of a naturally hydrating substance called hyaluronic acid (HA). But as you age, sunlight, smoking and other factors can reduce the amount of HA in your skin. The lack of HA causes your skin to lose structure and volume, creating unwanted facial wrinkles and folds - like those parentheses lines around your nose and mouth. Using a dermal filler like JUVÉDERM® XC is a safe and effective way to replace the HA your skin has lost, bringing back its volume and smoothing away facial wrinkles and folds. Because JUVÉDERM® XC is a simple, nonsurgical wrinkle treatment*, there is minimal recovery or downtime (and the results are instant!). So you can make an appointment to stop by Begin with your Skin Medspa for treatment on the way home from work or the gym, or even while the kids are at soccer practice—and get right back to your daily routine. howerver you should avoid strenuous exercise, the consumption of alcohol and extended exposure to the sun for 24 hours following your treatment. 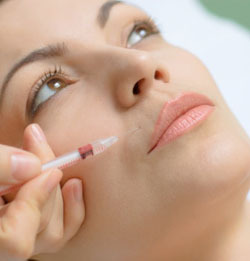 Exposure to any of the above may cause temporary redness, swelling, and/or itching at the injection sites. If there is swelling, you may need to place an ice pack over the swollen area. Be sure to report any redness and/or visible swelling that lasts for more than a few days, or any other symptoms that cause you concern to Begin with your Skin Medspa 651-905-1234.